I am aware that an infant receives one gene from the father and one from the mother, but what happens when the mother's Rh factor is negative and the newborn's is positive? What happens if the mother is O and the infant is A or B? What happens within the placenta and to the maternal blood poles which are connected by open ended arterioles into intervillous spaces? Will the chorionic villi be "demolished" and exchange of materials isn't as possible? Little harm comes from ABO incompatibility (that would have been a major problem with reproduction.) Rh incompatibility is more dangerous, though. If a fetus is Rh+ and the mother is Rh-, when there is mixing of maternal-fetal blood (at birth, but sometimes before that), the mother will form antibodies to the blood cell surface antigen. It doesn't usually affect the first baby (not sufficient antibodies), but if a subsequent baby is Rh+, there can be major consequences, which are multiplied with repeated exposure. Those maternal antibodies - which cross the placenta - can attack the fetal red blood cells and cause destruction of many of them (called hemolytic anemia) which, if severe enough, can be fatal to the fetus. It was a not-uncommon cause of fetal demise before Rhogam (Rh immune globulin) injections. The immune globulin shots are given to women who are Rh- with Rh+ mates at a period before birth (before blood mixing), and immediately after birth if the child is Rh+. The antibodies bind with Rh+ antigens and "mask" the antigen from the mother's immune detection, so to speak, preventing the mother from making antibodies that can be used against subsequent pregnancies. The major risk is to the fetal blood cells, not the placenta. The placenta isn't attacked. But with anemia, the fetus struggles, for example, without enough blood, the fetus can go into congestive heart failure and die. It's also possible to form anti-Rh antibodies from blood transfusions. 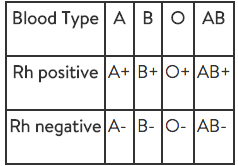 If an Rh- female has had a blood transfusion prior to her first pregnancy, maternal antibody levels will be drawn earlier during the pregnancy. Not the answer you're looking for? Browse other questions tagged gene pregnancy blood-group or ask your own question. Does a gene that regulates itself necessarily be a transcription factor?